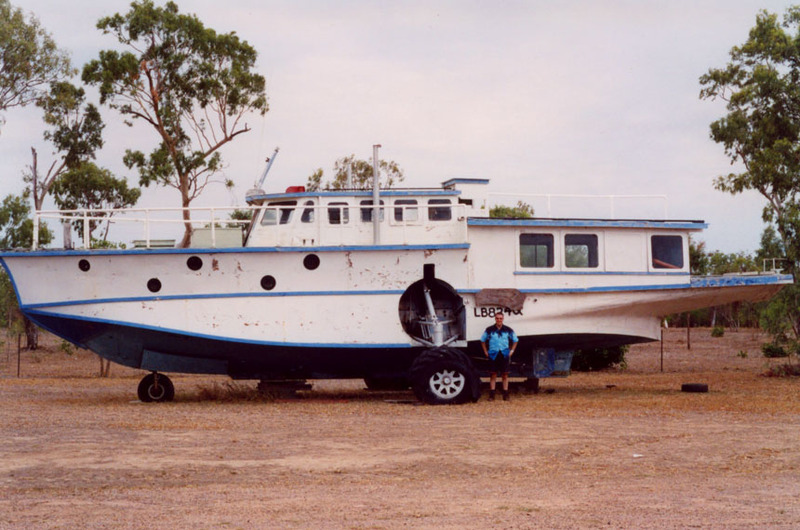 Planes turned houseboats in Australia - where are they now ? In many reference books and on websites VH-BRI, a PBY-5A Catalina flying boat c/n 1735), is listed as a converted houseboat and located at Shute Harbour,QLD. But the last sighting seemed to date from 1996. So I did not find it surprising that upon my visit it had long gone. When I asked around I was given the telephone number of the former owners, the O'Hara family. When I talked to them on the phone I was told it had been sold and had moved north, to Home Hill/Bowling Green (QLD). By that time I still had no idea what to look for and did not have the time to backtrack up north. So I was glad Terry Magee made this photo available to me: taken at Cannonvale on 25Oct75: one can hardly recognize in a plane in this houseboat ! Further updates about its present condition and location would be welcomed. Here is a map, look for Airlie Beach which is only a few miles from Shute Harbour. Home Hill is on the map too, look north. Lee Morgan wrote me (Mar.2006) with: "48373 (c/n 1735) to N10018 then N95R, now VH-BRI in Australia as a houseboat. Was DBR (=damaged beyond -economic- repair) 08Jul1962." 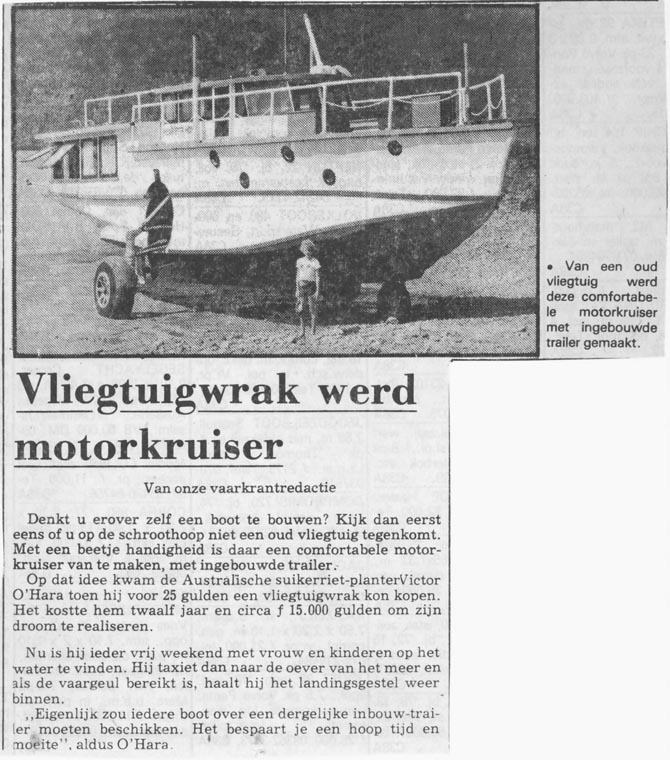 This article is from the Dutch newspaper De Telegraaf ("De Vaarkrant"), date unknown; it was reproduced on a Dutch-language forum about maritime vessels in Dec.2006, by Rob B.
Australian planter Victor O'Hara bought for 25 guilders a planewreck and after 12 years of work, and spending some 15.000 guilders on it, he managed to complete his work of dreams. Every spare weekend he takes his family and his boat out on the water; he loves the retractable landinggear: "every boat should have something like this", he said. "I came across your web page containing the picture of the converted Catalina houseboat, photo taken in 1975. I believe it is the same one I saw in a small Queensland town, my wife and I camped at in Oct. 2003, on our drive down from Cairns to Bundaberg. Unfortunately I cannot for the life of me remember the name of the town! I do remember it to be on an estuary. It was more of a holiday shack town than an actual working town, somewhere around the Airly Beach area. It looks a little different because the windows surrounds are large on the one we saw, compared to the photo taken in 1975. But my guess would be that the original windows on the houseboat would have probably been Perspex and no doubt replaced some time over the past 20 years." Ex U.S. Navy PBY-5A Bu 48373. Transferred from its Litchfield Park, AZ, storage (used for many ex-U.S. Navy Catalinas). To Remmert Werner, St. Louis, MO, USA, which then specialised in converting Catalinas to executive interiors, for conversion, initially without change to its nose. Its nose turret was later removed. Initially registered as N10018. By 1958, it was with the Beldex Corp., MO, as N95R; featuring an executive interior. It was purchased by A.T.I. and converted by Remmert Werner, St. Louis,MO to an airline passenger configuration (23 passengers), with conversion being completed Sep59. Registered VH-BRI to Ansett Transport Industries Ltd. 10/10/59, for use by ANSETT-ANA - 22 passengers. It departed St. Louis 10/10/59 and was ferried El Paso-San Francisco-Honolulu-Canton Is.-Nadi-Tontouta-Sydney; arriving 19Oct59, as VH-BRI (Captains Stewart Middlemiss, Lloyd Maundrell and E.W.P. `Pat' Adams & Engineer R. Bush). It was met at Sydney by R.M. Ansett. VH-BRI was already painted in a special color-scheme and 'ANSETT'-titles, including the words 'Consolidated Super 28' on the central wing support and had a faired nose plus a rear Convair CV-240-type 'airstair' for landside passenger use; passengers used the front- starboard door when on water. It was delivered to Rose Bay, for pre-service checks. Its 1st service, Proserpine-Hayman Is., was 12Nov59. It was based at Proserpine. Operated Proserpine-Hayman Island-Proserpine five times per day, 4 days per week. It was re-engined with more powerful (DC-4) engines, with conversion starting 27Jan60. Registered to Ansett Flying Boat Services Pty. Ltd. 28Oct60. Relaunched 03Nov60 and officially named `The Golden Islander' by singer June Bronhill at Rose Bay, Sydney on 03Nov60. At various times it appeared with large 'ANSETT' above small 'FLYING BOAT SERVICES', 'ANSETT F.B.S.' & 'ANSETT-ANA' titles - otherwise the color-scheme remained unchanged. It was struck off the Register the same date (3,241 hours). 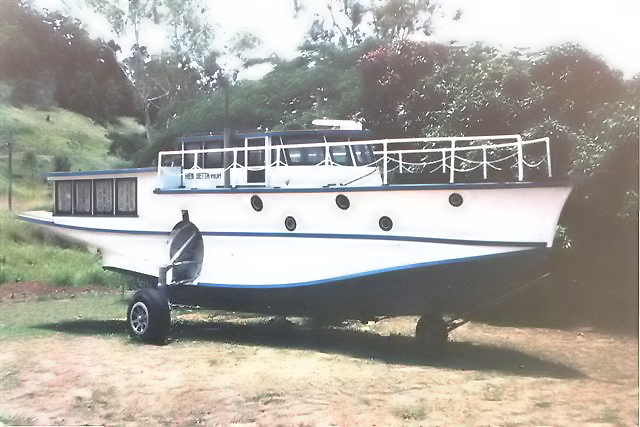 Its remains were sold to Vic O'Hara, Proserpine, for £5, converted & used as a houseboat. As far as I'm aware, it's still in the Proserpine area. 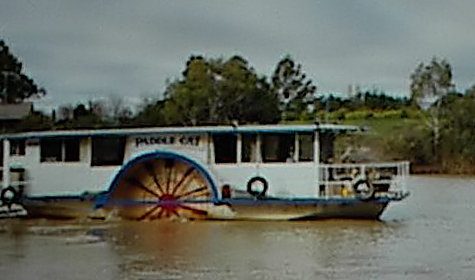 Whilst on the subject of Catalina-turned-houseboats, Allan Lebaron sent me this photo of the Paddle Cat, photo by the owner, Jim Vale. Allan wrote me the following information: "I have following information on BuAer 1216; it was of interest to me because it was from the original PW10 squadrons in the Philippines when the war began for the U.S. and my brother's squadron (VP-22) was sent out from Pearl with early-model PBY-5s as reinforcement. They lost almost all their a/c - I think two of the 4s survived, one or two of the -5s they had received from the Dutch, and one from VP-22, which was sent back to the U.S. and used as a trainer in Florida. I believe the -4s turned over to the Aussies were also used as trainers but were surplused after the war. This Catalina was a PBY-4 for the US Navy until March or April 1942, when it was turned over to the Aussies, who used it as a trainer for the rest of the War. I am quite sure the BuAer 1216 is correct and that it was A24-28 or A24-29 in Australian Service. Also, since it wasn't part of the Lend-Lease program, it didn't have to be either returned or destroyed after the war. 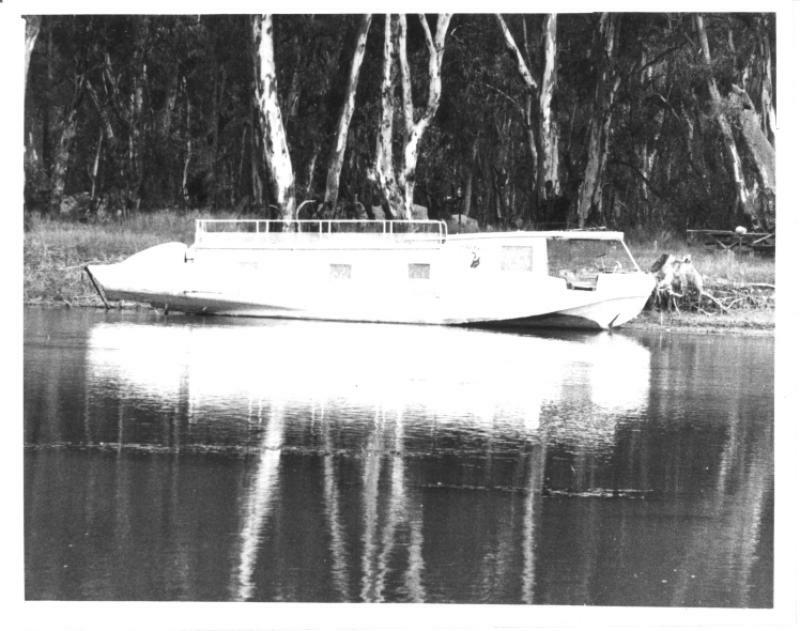 Jim Vale converted it to a houseboat at some point"
"I have an envelope from Jim Vale, Mildura, postmarked 27 March 1998. Here is a quote from his letter: "...regarding your query as to how I have managed to keep the hull free of water, the whole hull section is covered with fibreglass, it is completely dry and has not been out of the water for 11 years..."
"I can tell you that the Paddle Cat is being restored at Nangiloc; this information is 4 years old anyhow (I know the supplier). 2. name unknown at Picnic Point is another PBY Catalina"
Top is PV 'Paddle Cat' at Mildura 25Apr99 (by Roderick Smith) and above: at Picnic Point (upriver of Barmah), a houseboat of former Catalina flying boat in 1970 (by Neil Smith). The image above can be enlarged by clicking on it. 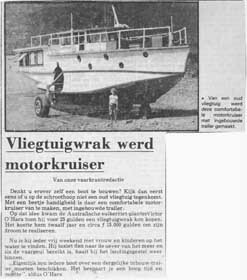 MV = motor vessel, not with paddles (i.e. screw driven, or outboard motor). This seems to cover everything, right up to the largest cruise liners. PV = paddle vessel: driven by paddles, but the motor is diesel. PS = paddle steamer: driven by paddles, with a steam engine. Sometimes L = launch gets used, but nobody knows when one category ends and the next begins. Ie SL = steam launch, but I haven't seen ML = motor launch anywhere. SS = sailing ship is common. MS = motor ship I have seen occasionally. The Paddle Cat was MV from 1947 until the Wentworth Club bought it, as it didn't have paddles then. It was then converted to have paddles. A lot of people running diesel-driven paddleboats call them paddlesteamers, but they aren't. My summary from the Plowman book agrees fairly much with the aircraft history in the earlier text on your page: one of very few survivors, then balance of the war in Australia. Gol Gol is Mildura area. 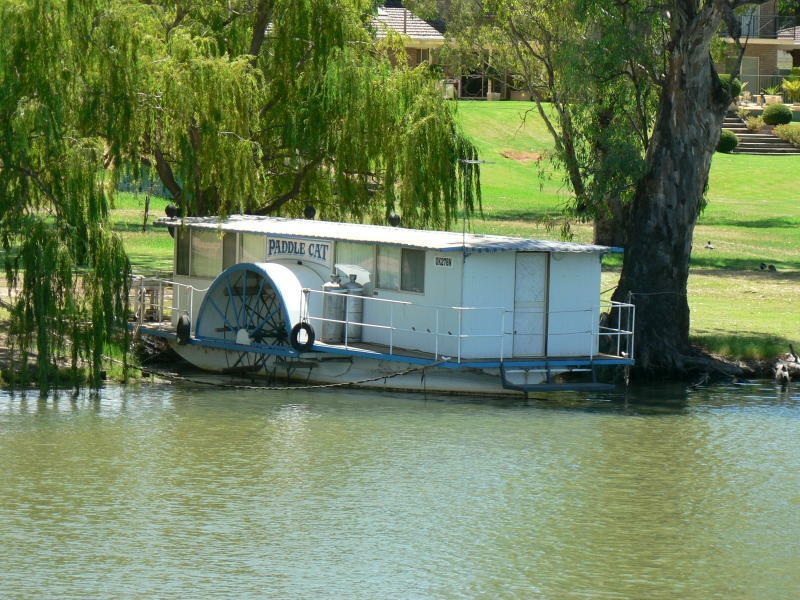 Mildura is the main city, on the south bank of Murray River. Buronga is in NSW, straight opposite Mildura. IIRC Gol Gol is in NSW, a little upstream, which is how I came to see it while on a commercial cruise. It is moored at the owner's property, which comes right to the water line (allowed in NSW, but not in Victoria). The north Queensland Cat has been reported well. One Cat, formerly at Picnic Point, was unmodified. It was retrieved and is now in the museum at Moorabbin Airport (Melbourne). The two which I am now chasing via Echuca contacts are/were: The mystery Cat described letter to you and a smaller boat, made from the front half of a Dornier... Keep you posted!" "... a Dornier Do.24 survived, although not in a complete state. The nose section of an unidentified Dornier was converted to a houseboat and used as such on the Murray river in Australia. When it was retired it lay unused for a couple of years in a town called Echuca, Victoria. It was re-discovered around 2008-2009 and after negotiations, it was acquired by the Lake Boga Flying Boat Museum, which is located at he shore of Lake Boga, also in Victoria. The nose section is restored and is on display in the Lake Boga Flying Boat Museum, along with the PBY Catalina which is on display there. The identity of the Dornier is not (yet) stablished as all identifying plates and numbers were removed during the scrapping. "